Since its beginning in 1998, King’s Hill Farm has remained unchanged in its desire to provide people with healthy and fresh food. Nestled in the hills south of Mineral Point, WI, King’s Hill Farm is certified organic and is surrounded by land conserved to encourage plant and animal biodiversity. King’s Hill Farm strives to cultivate healthy ecosystems, communities, and individuals through the sustainable production of vegetables. Whether you live in the Driftless region, Madison, or Chicago, we hope our work can bring you good health. Kjersten was studying wildlife management when she realized she was far more excited about soil and plants. She has worked at a plant nursery, a vineyard in South Dakota, a vegetable farm in Texas, and agriculture development non-profits in Minnesota and California. Most recently, instead of growing vegetables, she grew fungi in a lab at Michigan State University while studying for her Master’s degree in crop diseases. Kjersten is weirdly fascinated with all of the soil fungi and bacteria that help veggies grow and succeed. Dirk studied Political Science in college but quickly realized he was not suited for a desk job. A passion for food security led Dirk from the desk to an urban garden in Washington, D.C. where he grew his first crop of kale. After getting bit by the veggie bug, he worked on farms in Indiana, Texas, and Michigan, learning and asking questions all the way. Dirk is obsessed with growing fantastic salad greens. 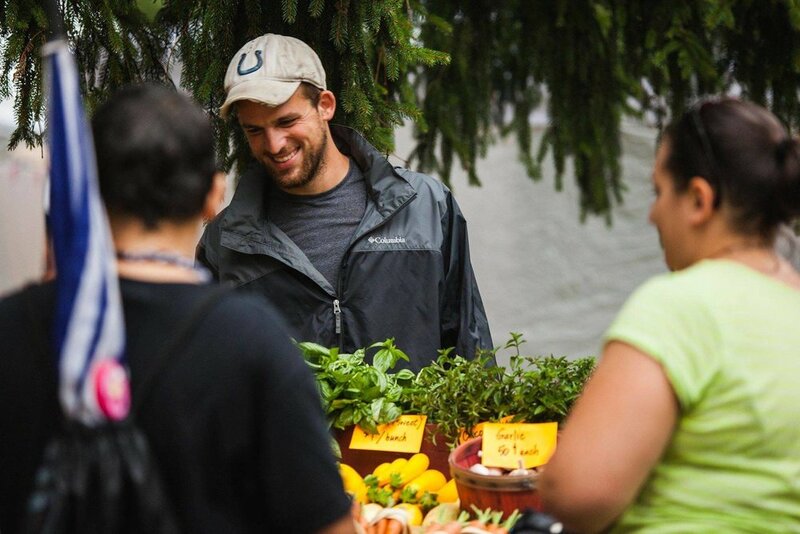 His favorite thing to hear at farmer’s market is: “Your salad mix was the best I’ve ever had”.